I am drifting. I am drifting back through my memories. As I go, I trace my memories with my fingertips the way I would woodgrain. In the wood, a buried history is marked, made by the passage of time, season by season. Here is a shape. Here is a name. A weaving of lines, letters, and symbols, unfurl at my touch. What lays before me is a year, splayed wide like a split tree trunk. It is a year in review. If I were to call this past year anything, it would be deemed A Year of Change. I think "change" is like the weather; there is always weather. Be it fair or foul, there is always weather. But there are some years where there is more rain and some with less – times of drought and times of flood. This year was flooded with possibilities. It was swollen with the opening of doors and the moving currents of change. It hasn't been an easy ride. Sometimes the waters were choppy, but I think that out of it, out of struggle came something even more beautiful, a sense of community and stronger friendships and even more personally, a better sense of self. I've moved, literally and figuratively, towards making what's important to me paramount. The journey to finding the road has been richly studded with new experiences and the remembrance of old ones, good ones. the one to have HOPE. So to you, all of you, beautiful and wonderful and magical people out there reading these words, I give you, from the very core of my being, hope. A little four letter word, that fostered with love and friendship and kindness will bloom and grow powerfully. It will grow. It will grow and nurture and give shelter and abundance. Let this next year, be a year filled with hope. Look what came in the mail today! 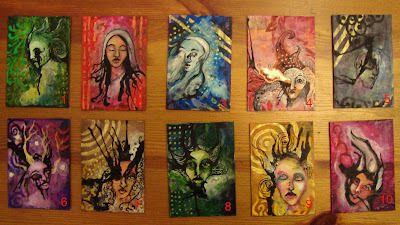 Lured in by the seductive deals and giveaways on VistaPrint, the very talented artist, Amy Ross, hosted a holiday postcard give away on her blog. Her inspiration was "Peace-on-Earth-y." CLICK HERE to visit her blog and CLICK HERE to visit her website to see more of her amazing work. Here's another fun and funky design I made with summer in mind. Even though it has some bigger beads on it, it is still pretty light since the chunkier beads are made of wood and polymer. I've utilized a lot of different materials here. I used ceramic beads from Keith O'Connor, vintage German glass from Talisman Associates, wood beads from J&M Gems 'n' Things, polymer from Pam Wynn/Heather Wynn, Czech glass from Raven's Journey, vintage African glass from Chevron Trading Post, and Vintaj natural brass from Jamie Hogsett. 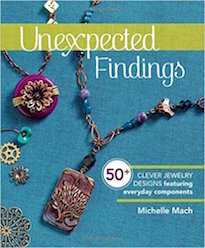 I think the shibuichi sunflower clasp from my family at Green Girl Studios pulls it all together. 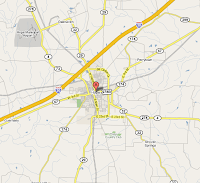 "I still believe in Hope – mostly because there's no such place as Fingers Crossed, Arkansas." Molly Ivins was a liberal journalist and political commentator known for her injections of Southern colloquialisms and dark humor. The first on the left is made up by light blue niobium ear-wires by the Odyssey and Bead Expressions, dark indigo Swarovski crystal rounds from Fusion Beads, and Peruvian opals, potato pearls, and turquoise leaves from Talisman Associates. The second pair, in the middle, are made from ear-wires from Saki Silver, branch links from Candice Wakumoto, and pearls and Czech glass from Talisman Associates. The third pair, on the right, are made from rose-gold colored niobium ear-wires from the Odyssey and Bead Expressions, faceted pearls from Talisman Associates, sterling silver findings from Candice Wakumoto, and engraved shells from LillyPilly Designs. The earrings on the left are made up of lucite leaves and chain from Ornamentea, grey opal and crystal clear Swarovski Crystals from Fusion Beads, sequins from Gail Crosman Moore, and brown niobium ear-wires from Marti Brown at the Odyssey and Bead Expression. 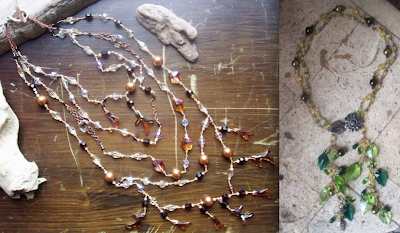 The middle pair are made up of sequins from Gail Crosman Moore, engraved shell from LillyPilly Designs, chain from Ornamentea, and ear-wires from the Odyssey and Bead Expression. The pair on the right are made of Vintaj natural brass from Jamie Hogsett, ceramic faces from Melanie Brooks Lukacs of Earthenwood Studio, sequins from Gail Crosman Moore, light blue niobium ear-wires from the Odyssey and Bead Expression and amazonite rondelles from Talisman Associates. 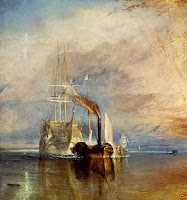 Left: "The Fighting Temeraire," painted in oil by JMW Turner in 1838. Here's a new very organic piece that I made. It's very summery. If you can't tell, I dream of warmer days and fantasize about sun-kissed cheeks and barefoot walks along the beach. The winter is not my friend. We are, at best, civil to one another. The clasp is from my friends at Saki Silver. The ocean jasper, white coral, and pink chalcedony are from Talisman Associates. The polymer beads are made by Pam Wynn/Heather Wynn. 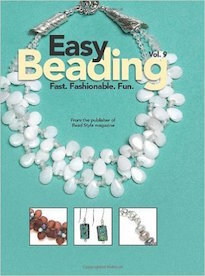 The chain and Elaine Ray ceramic beads come from Ornamentea. I thought that perhaps this winter I would be able to skirt around being sick. I had grand fantasies that if I stayed inside and never left the house, I'd be immune to the nasties floating about. Unfortunately I did have to leave and the combination of pressure and stress just caught up to me. So, I've been nursing my maladies quietly, trying not to fuss on my blog. I don't want to sound like I'm chronically ill. It does feel that way though. Anyway, I'll be resting and recovering from my minor aliments. If I don't get right back to you right away, then I apologize, but I'm most likely lying prostrate, slathered in vapor rub and dipping in and out of cold medicine blurred consciousness. So sorry, but I am feeling a little bit better and should be much recovered soon. 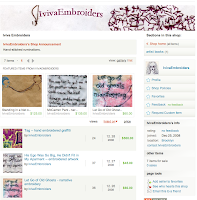 My very talented friend, Iviva Olenick, just started her very own Etsy site! Often times humorous and heartbreaking, her embroidered pieces capture the bittersweet feelings associated with modern day dating and romance. Her pieces feel as though they were confided to a close friend – poignant commentaries and seemingly unintentional poetry. CLICK HERE to visit her new Etsy site and CLICK HERE to see more of her work. I came across the "Typealyzer" website and thought I'd give it a whirl with my own blog. Surprisingly, it seems quite accurate. CLICK HERE to visit it and try it out on some of your favorite blogs. This is the sunrise seen from my window through the back alley. It was so brilliant and full of color. It was the perfect contrast to the grey and dreary days that have proceeded it. Come drool over glass bead artist Kerri Fuhr's fabulous creations! 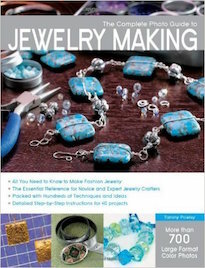 Giving With Your Jewelry Skills - With this coming new year, consider some new ways you can give back with your jewelry making skills. Did Santa bring you beads from your wish list? 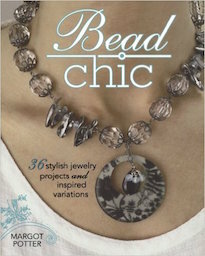 Use your new beads in these free projects from ABS! 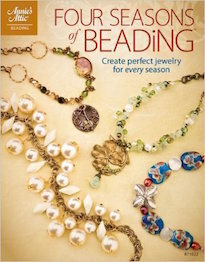 Planning on coming to the 2009 Bead&Button show? Pre-register today to make class sign-up a breeze! Marketing Monday (on a Tuesday) - Barbe discusses how to cast the net wider. Carmi makes one last Christmas ornament that could also be worn. Jeans makes some SWEET earrings, using Green Girl Studios' beads! The fabulous crew over there are working on a book – it is going to be GREAT! No doubt about that! Melissa shows off a simple snowflake necklace for her final seasonal piece of the year. Most of the evening and day were spent cooking and cleaning the apartment in preparation for our feasting time. Our group in person was small and intimate, just Alba, Jen Tong, William, and me. Even though there was just a handful of us, the apartment seemed brimming with good vibrations and well wishes; as though we were in fact joined by all the countless friends and families celebrating and feasting, our tables conjoined and connected across the folds of time and space. Above is a quick digital collage I did of a couple of different pictures of me. All of the pictures taken early on in the evening were all blurry. It felt like I was a whirlwind of productivity, cleaning and cooking and making ready for the meal. I felt in motion and the pictures reflect that. After all the cleaning and moving furniture around, the above picture is how the apartment turned out. Very warm and cozy. (You might notice that this isn't just one picture of the room, but three that were digitally collaged and mended together. I wanted to show a panoramic of the area.) The pictures were taken with the overhead fluorescent light in the kitchen turned off. 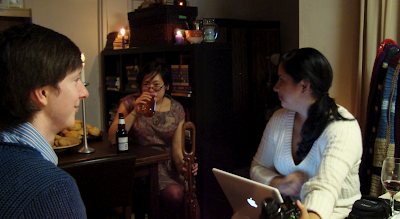 This picture of William relaxing, Jen Tong sipping on sweet tea and holding the walking stick I found the other night, and Alba online, was taken while I was prepping dinner in the kitchen and had to have the over-head light on. Of all the pictures that were taken last night, this is perhaps one of my favorites. It's blurry, but I still like it. I snapped this of Jen Tong without her noticing. She looks very lost in thought and reflective. 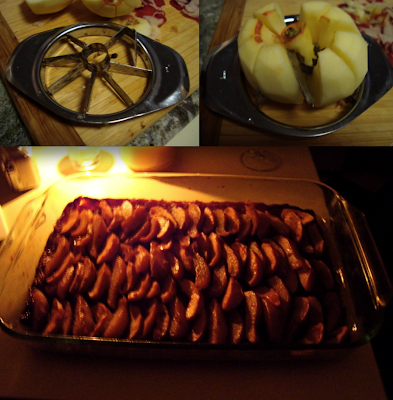 One of the things that I made for dessert was a wine poached pear and apple tart. I tried to use the apple quarterer, but the welding snapped and broke! I was so disappointed. Luckily the knives that Beki sent made quick work of the apples and pears. Above is the broken and shameful apple quarterer. After I cut the pears and apples, keeping them in a lemon-lime concoction, (so they wouldn't turn brown), I poached them in a mixture of brown sugar, a sweet white wine, water, a vanilla bean (halved and scraped), star anise pods, lavender blossoms, crushed dried hibiscus flowers, and Vietnamese cinnamon. When they had been baked for an hour in this combination, I removed the pear and apple pieces and reduced the liquid. While the liquid was reducing, I rolled out the pastry crust, baked it for a few minutes, and then arranged the apple and pear slices. I melted in some butter in the reduction sauce and used this to glaze the tart. The above picture at the bottom, is of the finished tart. As the title of this post suggests, I forgot the sweet potatoes. I heated them up in the microwave and ended up blocking it with the hot crock-pot and forgot that they were still inside. For dinner, I made a stuffing, biscuits, slow-cooked beef in a hearty tomato and onion sauce, asparagus, homemade orange cranberry sauce, and deviled eggs. For dessert I made the tart and some sugar cookies. During dinner, we decided to make a Prosecco toast to friends, family, love, laughter and life. (The second toast was for all of you out there in Blog Land and for all of those who couldn't join us in person.) I'm really glad that we decided to get together after-all and feast with wild abandon. It was a perfectly mellow and fun time. Dessert some how didn't seem over yet. Not without chocolate. It just didn't seem right. During dinner, I had mentioned a favorite Southern breakfast of mine, chocolate gravy biscuits. We had some biscuits left over from dinner. So, I whipped up a quick batch of chocolate gravy and demonstrated just how to eat it. 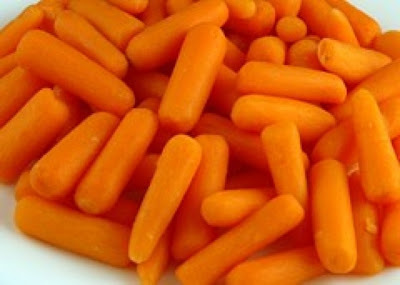 Below is a picture of the yummy results. It was very tasty with the after-dinner coffee. Our post-dinner plans consisted of us all relaxing and chatting over good wine and great coffee (courtesy of Gaea from Ojai, California). 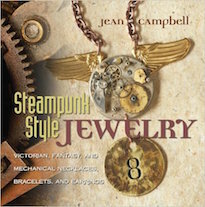 Jen Tong and I had a "design consultation" and discussed the necklace I would make for her. Alba and William discussed Spanish literature and poetry, talking about Borges and Lorca and the like. It was a good night and a very happy Christmas. Tonight I whipped up some chicken that was cooked in a white wine, rosemary, and butter sauce. I topped it with a couple of dried orange essence infused cranberries. It was very tender, juicy and flavorful. On the side I fixed a baby carrot risotto cooked down in beef stock. Everything turned out pretty good. Tomorrow is Christmas! Happy Christmas everyone! I don't really celebrate anymore. At least not in the traditional sense. As I've grown older, I've learned to appreciate tradition and ritual more, but find that it doesn't always fuse well with the practicality of my day to day living. I think these things act as a catalyst for magical thinking. You know, getting in the mood for the holidays and all. It's my hope though that every day be a holiday and filled with magical thinking– that we treat each other with kindness and compassion, feast gloriously, give gifts, sing praises, and love unconditionally. Not just one day, or twelve days, but everyday. So, instead of abundant gift giving and all the pomp of Christmas, I'll settle on the core essentials: kindness, reflection, and glorious feasting! Now, I'm not just making this gesture in words only. If you're in the New York area and find that you haven't any plans or have plans earlier in the day, then you are welcome at my table. Dinner starts around 5PM. Don't worry if you think you don't know me well enough – I promise not to bite and I've been told that I'm a good cook. Believe it or not, I can be kind of entertaining! For an evening, I will shed my semi-reclusive ways and will open my home to you. Don't spend the holiday alone. I've spent a couple on my own and have discovered that it is definitely not conducive to feasting and merry-making! EMAIL ME for directions and to let me know you'll be by. This may sound a little crazy, but hey, we live in a crazy world. So, don't be afraid. And for those of you who can't make it in person, you'll be here with me in my heart. Sounds pretty lame and cheesy, but the friendships I've made and will make are very important to me. They are a life-blood that keep me going. I appreciate you. I thank you, friend. Remember these? I traded them with blog readers for whatever they thought they were worth. (One of the only stipulations was that they not send me a dirty gym shoe!) CLICK HERE to see the original post. Erin of Every Heart Crafts, claimer of #1, sent along some of her lovely ceramic leaves, tea, a green aventurine, a cute little calendar and an assortment of lovely beads. Lorelei Eurto of designs by Lorelei and owner of #7, put together a package of an amazing little watercolor she did of an owl friend for me, a lampwork owl by artist Payton Jett, and a rocking assortment of beads. Lisa Harrington of Lucid Moon Studio, who got #2, sent YUMMY Godiva Chocolate, a coffee substitute, lots of seed beads, shells, an origami owl, a set of grilling cook book cards, information about a sea turtle agency she volunteers for, various beads and some stickers. Stephanie Townsend, an artist out of Tucson, Arizona and owner of #3, put together a package of a silver bird, an assortment of beads, a cute little wicker basket, lots of Chinese coins (the kinds with the holes in them), and a cross-stitch of an Ottoman design. Pam Ferrari, the claimer of #5, sent along her favorite candy - Good & Plenty, lots of lampwork and dichroic glass goodies, and some silver beads. Snagging #10, Gaea Cannaday of the amazing Gaea Pendants, sent some super good smelling coffee, a book of poetry her mother wrote and she helped illustrate, and some of her phenomenal ceramic goodies! Grabbing #9, the enchanting Nancy Schindler of Round Rabbit, put together a package of two of her own artist trading cards, a spice dish she made, and lots of her ceramic goodies. Wonderfully delightful Norma Lewis, the owner of #8, arranged with the very talented artist Anne Choi to get me this much coveted Dancing Stag Beetle Bead, which reads, "Silver moon upon the deep dark sky this sleeping world you wander by." Cristi of 2 If By Sea, and owner of #4, sent along this very tasty chocolate covered popcorn (which was really amazing), a couple of her favorite CDs, some vintage glass beads, and some PMC charms and beads she made. I wanted to THANK everyone who participated and sent in their goodies. I really appreciate it. Everyone was really generous and simply awesome! Each day there was a surprise waiting in the mailbox. The experience was very good and I hope to do more trades in the future. THANKS again everyone! Must go to the land of poetry. The story, focused on writer, Maggie Black, and her investigation of the death of her mentor and friend, a poet named Davis Cooper, is just that – a foray into the land of poetry, the mythical and magical Rincon mountains outside of the city of Tucson, Arizona. The mysteries of the mountain and its inhabitants, both human and otherworldly, slowly unfold in this poetry-studded exploration of the desert and the many different inner landscapes there. 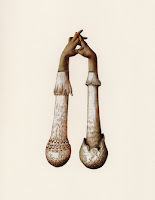 Above: Illustrations done for The Wood Wife by Brian Froud. What struck me about this novel, besides how beautifully written it is and how likable many of the characters are, is that it felt familiar. I've been visiting the deserts of Tucson for the past few years now and I must say that there is an incredible magic there. One, that despite growing up far away under the shade of citrus trees and the blaze of the Florida sun, is easily recognizable. I was born in the desert and I think there's a little bit of it in my heart. The desert recharges my spirit in a different way, a way touched on in the novel. The other thing that's familiar is that we grew up on a steady diet of Brian and Wendy Froud. Recently, we've had the pleasure of meeting them and their son, adding a new depth of respect and admiration for these talented artists. 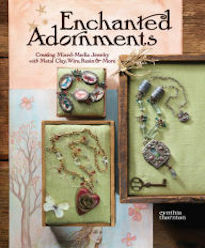 Terri Windling, of the Endicott Studio and the Journal of Mythic Arts fame, has pulled these things together and woven a rich tapestry of dreamy lushness. You can tell from reading her work that she's an artist and a poetess. So, both my necklace designs, "A Necklace for Frida" and "Rites of Spring" were selected as semi-finalists for the KGI Worldwide Design Contest! They're both moving on to the next round of judging! Wish me luck! They'll be exhibited at the CREATE YOUR STYLE IN TUCSON A CRYSTALIZED™ - Swarovski Elements Event at the K. Gottfried, Inc. showroom and on the website gallery. I'm THRILLED! The final spot in The Charm Club is up for grabs. If you're interested in finding out more, CLICK HERE to go to the original post. Hurry! Don't let this opportunity pass you by! EMAIL ME to reserve your spot! The piles of laundry accumulating could not be ignored, which prompted me to leave the apartment. It's been a while since I left. Since I had to take the laundry, I figured I'd stop at the bank, and while I was at the bank, I thought, "Well, I might as well take the train." I'd be lying if I said that I wasn't a little overwhelmed. The world was buzzing around me, rushing around in loud and bombastic motions. It made navigating the iced over sidewalks treacherous. I slipped a couple of times (but luckily didn't fall). So, I ran my errands. First I took the laundry. Then I went to the bank. 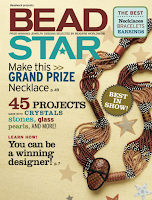 After I finished up, I took the train to Barnes & Noble to pick up a copy of the new Bead Star magazine. (I haven't gotten my copies yet, but wanted to see it in person and knew B&N would have it.) Magazine in hand, I stopped by the copy center to make some color copies of some collages I'm working on. I realized in the reflection in the copy center glass divider that the winter was drying out my skin and my head looked pretty awful and that my nose was dripping. Thusly, my trip to the drug store for a pocket-sized pack of tissues and some lotion for my drying out scalp. As I was leaving, I saw the glint of a familiar sign: Trader Joe's! 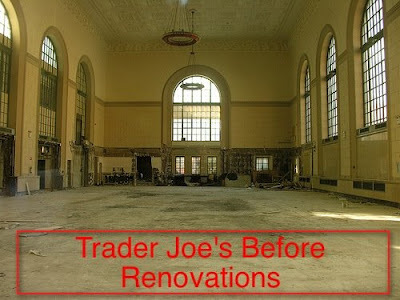 Apparently there's a new Trader Joe's in Brooklyn in an old bank. It's beautiful and what makes it even more beautiful is that it's not as crazy packed as the one in Union Square, which has a snaking line to just get in sometimes. I picked up some dried cranberries and more baby carrots (besides coffee, my main dietary staple), and some mushrooms intended for dinner. For some reason, I remembered that I needed to get some more flat-back adhesive. I had just run out. I have plenty of super glue on hand, but one should NEVER use cyanoacrylate as an adhesive for crystals. Not only does it damage the foil backing, but it clouds over the crystals. That basically translates into hand cleaning each and every single crystal meticulously. I popped into a couple of hardware stores and a few more drug stores, but they didn't have anything that I could use. Most of them carried two part epoxy, which in theory would work... it'd just take ages for it to set up and I have a feeling that I'd be sitting there holding crystals in place praying that they wouldn't slide or move at all while the epoxy cured. Eventually though I gave up. I guess I figured that I could go to Mode International Beads tomorrow which is a few blocks from my apartment. Alas, I was so turned around that I really didn't know where I was anymore. So, I kept walking until I found familiar streets and sort of intuited my way around. It was cold out and I had to stop a couple times to refuel at various coffee shops – just quick pit-stops to guzzle warm coffee to keep me going. 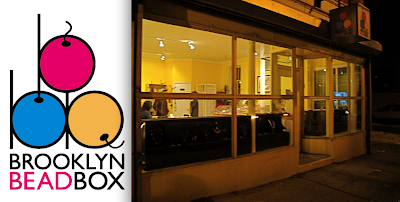 That's when I passed the Brooklyn Bead Box! I knew that they'd have what I needed. Luckily, I found my way relatively easily to a train station. Unfortunately it wasn't the one that I wanted, but I managed to calculate a route that would take me home. The only bad part of the plan was that I fell asleep on the train and missed the transfer station. I didn't want to ride down to the very tip of Brooklyn and change trains at Coney Island. Instead, I decided to walk. 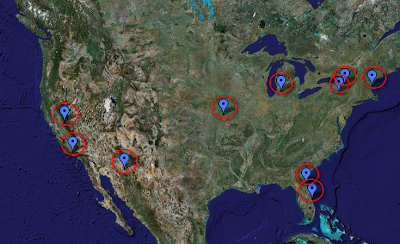 It didn't look very far on the map, but those things are rarely drawn to scale. I ended up walking a long way and had to perilously traverse the icy sidewalks. I would be disappointed with the way the day ended, but I found a prize! It's amazing! I found this amazing carved walking stick! 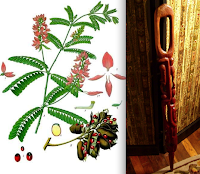 It's really elaborate and even has inlaid rosary peas or abrus precatorius. Fear not! I know that the seeds are poisonous if chewed and ingested. I'm a smitten kitten with it! Outside it is cold. It is dark. It is very windy. I can hear the wind thrashing and whipping the tree branches just beyond the window pane. It is howling like a pack of hounds. Tonight is the longest night of the year and it certainly feels like it. So, hold your loved ones tight and be warmed by your memories and your good intentions. Just because my head was hurting didn't mean that I wanted to skimp on eating well. (Far too often I get in the cycle of feeling not well and then not eating anything and then have it get worse. Ugh!) So, I recreated an old favorite from the Thornton family household. I made a HAMBURGER PIE! We got the recipe from one of those ochre-colored plastic cubes that were like recipe file-folders. I imagine that they had a different idea what appetizing looked like, because most of the pictures didn't look very good. However, nonetheless we used to make the hamburger pie and it seemed to be a crowd-pleaser. In my version, I cut in pie dough in the mashed potato pie topping. I lightly baked the pie dough so that it had a little bit of crunch. I also formed the potato mixture into little flattened discs to cook all the way through and make it look pretty. When it's cold and snowy out, I don't leave the house. I try to avoid it at all costs. So, much of the "nature" that I witness is either on the television or out of the window. In the back alley, I watch the house sparrows. I love them and their cute little fat bodies. After I researched them for a sculpture I made, I started to see the differences in the sexes. This is a pair that I see together often. I call them, "The Lovers." Beki sent along another box of Christmas present goodies! I got another AMAZING scarf. I've always wanted one like this. Dark red and black. It's beautiful and so soft. She also sent along some knives and a peeler. They're gorgeous and very sharp! To keep them sharp, she also sent along a sharpener. The cheese cutter looks like some kind of alien ritual blade. I like them all very much. For breakfast this morning I made musubi. I tend to try and make things that bring back good memories. 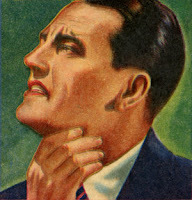 The power of smell and taste is a powerful trigger to memory. Musubi reminds me of Hawaii and the wonderful time I had there. I begged Renee (one of the other vendors at the bead show who is SO supremely nice) for the secret to making good musubi. She said, "It's so easy! Spam, soy sauce, and brown sugar. Bam! Done!" I marinated the slices of spam in the mixture and then fried them up. Afterwards, I reduced down the remainder brown sugar and soy sauce mixture and made a sauce to glaze the slices in. It was YUMMY! 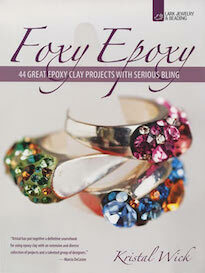 Art Bead Scene's challenge theme this month is, "Puttin' on the glitz." When I think of "glitz" I tend to think about Swarovski Crystals. Below are a couple of designs that I've made. Some are older, some were reworked from older pieces, and some are completely new. The name, "jonquil" refers to a type of daffodil that only blooms in spring. Rites of Spring utilizes both this cool, crisp color and its symbolism. Clasping in the front, this asymmetrical mix of jonquil, peridot, and a rich selection of greens was created in honor of the first buds and tender branches of season. Inspired by nature, I wanted to create a ballet of Crystalized - Swarovski Elements that would playfully dance around the wear's neck, while paying homage to the season and it's abundant fertility. The last rays of the sun streamed through the window, announcing in scarlet its departure. I looked out unto the sea of sand and sky, thinking of snatches of epic poetry. Homer described it as his wine-dark sea. But he was talking about waves. I looked out on desert, but couldn't break this image. Instead of the currents of the ocean, I studied the shifts in the dunes in the fading light – undulating like Homer's sea traveled by heroes and gods. I created this multi-strand necklace to capture that particular light. Frida Kalho was a Mexican Surrealist painter, who's tragic personal narratives are vibrantly infused with traditional Mexican motifs and allegorical symbolism. One of her most famous paintings is called the Self-portrait with Thorn Necklace and Hummingbird. I was inspired by her life, her work, and this painting. The challenge was to translate all of this into a piece that would do the artist justice, but stand alone on its own merits. 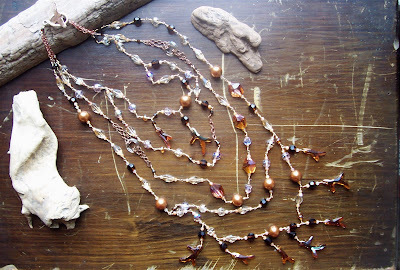 I created this organic and asymmetrical multi-stranded necklace, blending striking coppers, shimmering golds, and pretty pinks that are punctuated by earthy browns. I once watched a documentary on the flight of birds. At one point, they tried to boil down exactly how birds flew into scientific equations. The numbers and symbols moved in fluid lines and mathematical streams of text, becoming beautiful lacy patterns. I attempted to recreate this feeling with a cascade of compounded wire-wrapped links, weaving the air around the wearer's neck. The bright red punctuates the flow of crystal clears, opalescent translucence and shimmering silvers. Like the equations, this necklace demonstrates the hard work and graceful beauty of learning to fly.